BOSTON — Frederik Andersen settled the puck behind his net, patiently faked out the hard-charging Brad Marchand and zipped a pass beyond Patrice Bergeron to clear the defensive zone. 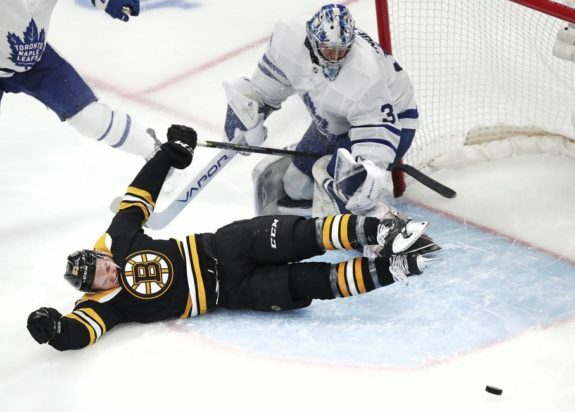 It was a subtle sequence in the third period of the Maple Leafs’ convincing 4-1 victory over the Boston Bruins in Game 1 of their first-round playoff series. It was also a move Toronto’s goalie might not have even attempted a month ago. 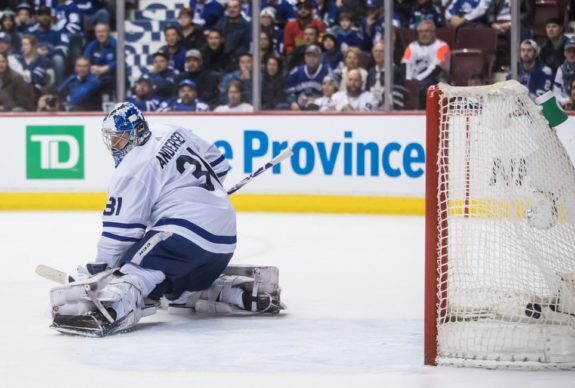 Andersen, who was exceptional in making 37 saves to help secure Thursday’s triumph, endured a miserable March — a confidence-sucking stretch where the Leafs, all but locked into their matchup with the Bruins, didn’t have a whole lot to play for. Usually cool in his crease, the 29-year-old seemed antsy. Waiting for the play to develop is one of Andersen’s strengths. During those wobbles where his save percentage sat at just .874, he was often caught chasing the play, guessing what was coming next instead of using his instincts to react. “You try to simplify things and make your focus be on shorter-term things,” Andersen said Friday. “Even when you’re doing well, you want to keep your focus on your next five yards instead of on the next mile. 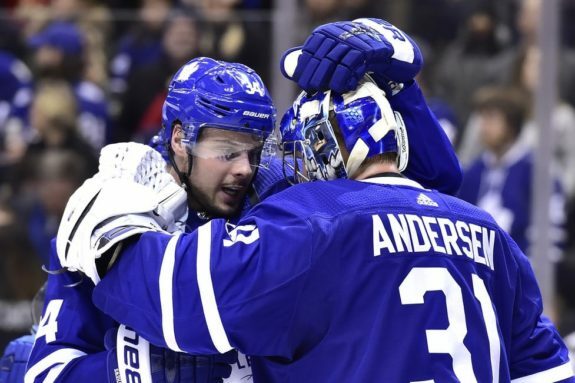 “You just work through it,” Andersen said of those March struggles that started to evaporate once the calendar flipped to April. “You go through different periods where it goes better for you (and) sometimes it doesn’t go as well. You learn from it and you keep pushing. The Leafs, who fell to the Bruins in seven games in the first round last spring and are looking for the franchise’s first series victory since 2004, believed their No. 1 netminder would rediscover his form. Leafs defenceman Jake Muzzin, who knows about championship-calibre goaltending from his two Stanley Cups with the Los Angeles Kings, said Andersen’s demeanour helps set him apart. Andersen, who had an .896 save percentage in last year’s playoff defeat to the Bruins, will likely be under siege early in Saturday’s Game 2 against a desperate opponent that knows losing a pair of contests at home to start a series is often a death sentence. The Leafs, meanwhile, won their first Game 1 since 2003 and will be looking to go up 2-0 for the first time since 2002. Toronto hasn’t won two games on the road to open a series since 2001. Toronto did a good job limiting the line of Marchand, Bergeron and David Pastrnak — the trio combined for 30 points against the Leafs last spring — at 5 on 5 in the opener. “You’re going to let in a goal, you’ve got to focus on what’s coming next,” he said. “You don’t get a chance to get it back. Now is not the period to analyse it.